Simplify your camping experience and use Camp Chef's Carry Bag for your 2 burner stove. This durable bag is a necessity for transport and storage. Also doubles as a great gear bag. If you want wheels check out the Roller Carry Bag (RCB60). 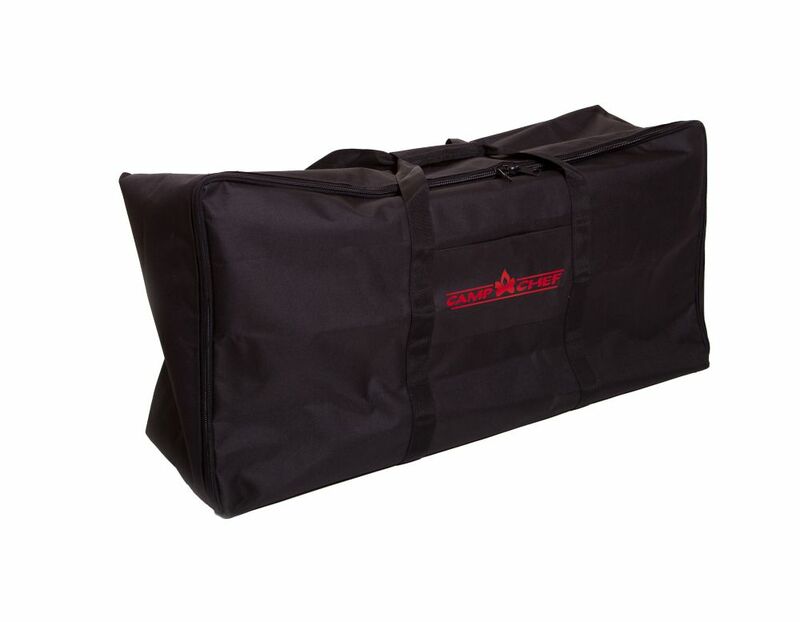 Easily carry your Sport Grill Barbecue Box and protect your investment with this water resistant carry bag. Features full wrap weight balancing nylon handles. Fits model BB90L Features Weather-Resistant Liner Wrap Handle for Added Support Large, Industrial EZ Glide Zipper Top loading design Fitment BB90L BB90LS PZ90 Specifications 18.5" x 25" x 8" Weight: 2 lbs. Store and transport your flat-top griddle with convenience and ease. Durable construction. Bag features wrap handles. See bag dimensions below to ensure correct fit. Features Weather-resistant liner Wrap handle for added support Durable construction Large, industrial EZ glide zipper Specifications Dimensions: 20" x 31"
The Outdoor Big Screen 92 Lite is made of a durable oxford nylon reflective material, making it perfect for highresolution picture and enriched colors. The screen is designed for front projection making it versatile in almost any situation, indoor or outdoor. Great for movies, business seminars, sporting event, gaming, and more. Set up is quick and easy. Simply connect the frame together, clip the screen into place, tighten the straps and the screen is ready for viewing. Stakes and tiedown guy lines are included for increased stability. When finished viewing, everything neatly packs into the carry bag for storage. Durable carry bag for simple storage and transport of your triple burner stove. Excellent construction at a fantastic value. Also a great gear bag. Features Weather-resistant liner Large, industrial EZ glide zipper Top loading design Wrap handle for added support Specifications 17" x 40.5" x 10" Weight: 2 lbs. Universal Two Burner Carry Bag Simplify your camping experience and use Camp Chef's Carry Bag for your 2 burner stove. This durable bag is a necessity for transport and storage. Also doubles as a great gear bag. If you want wheels check out the Roller Carry Bag (RCB60). Universal Two Burner Carry Bag is rated 4.8 out of 5 by 12. Rated 5 out of 5 by Lisha75 from All around awesome We love the bag! Easy way to store and carry your Camp Chef. Rated 5 out of 5 by Northwest camper from Perfect carry bag The camp chef carry bag is perfect for my two burner explorer stove and enough room for accessories as well. It seems to be well made and is heavy duty. Nice addition to our camp. Rated 5 out of 5 by Ames from Well made In my opinion, both bags are well made/well suited for their intended purpose. I am satisfied with the purchase. Rated 5 out of 5 by kclilek from Perfect storage! I used to think buying storage bags for the various equipment my Boy Scouts use to be luxury items that were not really needed. I've changed my mind when it comes to storing and protecting our Camp Chef Stoves! The Camp Chef Carry Bags are perfectly designed to store not only the 2-Burner Stove itself, but it also has pockets in the upper flap to store the back shield and the four legs extensions with thumb screws inserted. These bags are very well designed and structurally strong with excellent zipper closures! Now trained, my Scouts, have no problems looking for the stove components when erecting and ultimately re-storing our stoves. These carry bags are wonderful additions to our stove storage systems and they make it significantly easier to carry our stoves to and from our trailer! Thank you Camp Chef! Sincerely, K. C. L.
Rated 5 out of 5 by mable from perfect for carrying stove Glad I bought it makes carrying legs and wind block easier and right in one bag. Only change might be either make it thicker or add a little more padding to burner side to keep from wearing through if burner is hauled a lot on trips. Other than that no problems. Rated 5 out of 5 by Vol Camper from Perfect Fit Anyone who camps knows that storage space is a precious commodity! This bag is perfect for storing, transporting and protecting my Camp Chef Explorer 2 burner stove! A camping friend saw my bag and was so impressed that he purchased one for his Camp Chef stove as well!